In phase II, you will learn how to use the simulator and experiment with and develop complex multi-agent algorithms. In simulation, you can run algorithms faster and use more robots and sensors than you could (easily) in real life, which greatly facilitates exploration of different types of algorithms and allows you to answer "what if" questions. The simulator is fairly easy to use and is extensible, meaning you can add new sensors or other capabilities to the robot, or measure different things about how the collective performs. First, you should learn how to use the simulator by reading the simulator overview page. In phase II, you will use the simulator to develop maze solving algorithms. 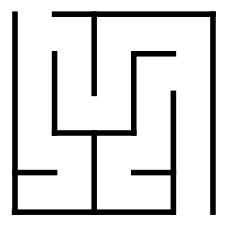 The robots enter a generic 2D maze, some examples of which are shown below, and must reach the exit. Success could be just one robot exiting, or all robots exiting. Some algorithms may work well for a single robot, others may be better for many robots. Some algorithms may only work when the robots have an extensive sensor suite, some may work with very minimal sensors. Some algorithms may be good at making one member of the swarm finish quickly but the rest never make it out, and other algorithms may be good at getting everybody out but take longer to do it. You will implement and characterize various algorithms, at least one of which must be implementable on the Kheperas (that would be a fairly minimal-sensing algorithm). a corridor-style maze a maze with open areas a patterned maze an irregular "maze"
This part of the project requires some creativity on your part. We will not tell you exactly what to do or which algorithms to implement. You should experiment and see what works and what doesn't. We have some ideas and can help you out, but you should also find or generate some ideas on your own. The simulator is capable of measuring a lot about how the swarm is performing. How long until the first robot exits? How long until the last robot exits? How do those times depend on the number of robots, and on the sensor ranges, and on the size of the maze? You will probably want to run a lot of tests to examine these dependencies. Luckily, the simulator can be run in 'batch mode' to run a lot of tests while one parameter (or whatever you want) is slowly varried. The specific analysis is also up to you. You need to decide exactly what to measure to study the properties of the specific algorithms you are investigating.